For a full list of excipients, see section 6.a. For the treatment of bovine respiratory disease (BRD) associated with Mannheimia haemolytica, Pasteurella multocida and Histophilus somni sensitive to cefquinome. 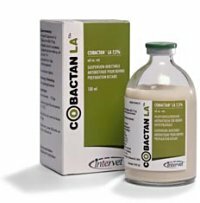 Not to be administered to animals which are known to be hypersensitive to cephalosporin antibiotics and other β-lactam antibiotics. Do not use in lactating cattle producing milk for human consumption (during lactation or the dry period). Do not use within two months prior to first calving in heifers intended for the production of milk for human consumption. Use of the product should be based on susceptibility testing and take into account official and local antimicrobial policies. Inappropriate use of the product may increase the prevalence of bacteria resistant to cefquinome and may decrease the effectiveness of treatment with cephalosporins, due to the potential for cross-resistance. Relapses of respiratory signs may be seen in treated animals 1-2 weeks after administration of the last dose. In such cases other treatment options should be considered. Penicillins and cephalosporins may cause hypersensitivity (allergy) following injection, inhalation, ingestion or skin contact. Hypersensitivity to penicillins may lead to cross sensitivity to cephalosporins and vice versa. Allergic reactions to these substances may occasionally be serious. Do not handle this product if you know you are sensitized to penicillins and cephalosporins, or if you have been advised not to work with such preparations. Handle this product with great care to avoid exposure by accidental contact with the skin and accidental self-injection.. Wash exposed skin after use. Persons developing a reaction after contact with the product should avoid handling the product (and other cephalosporins and penicillin containing products) in future. Subcutaneous injection of the medicinal product induces an inflammatory tissue reaction at the injection site. The lesions caused by the injection of up to 10 ml may persist for at least 28 days after the last dose has been administered. Fibrous plaques up to 15.0 x 5.5 x 0.2 cm may still be present. Application into the underlying muscle may result in muscle degeneration. There is no evidence of reproductive toxicity (incl. teratogenicity) in cattle. Laboratory studies in rats and rabbits have not shown any teratogenic, foetotoxic or maternotoxic effects. Use only according to the benefit/risk assessment by the responsible veterinarian. It is known that a cross sensitivity to cephalosporin exists for bacteria sensitive to the cephalosporin group. For subcutaneous administration: two injections with 48 hours interval. To ensure the correct dosage and to avoid possible underdosing, body weight should be determined as accurately as possible. Shake the vial well before using. It is recommended to divide the dose so that no more than 10 ml of the product are injected at one site. Do not use the same injection site more than once during a course of treatment. Overdoses of 3 times the recommended dose in cattle have been systemically well tolerated. For reactions at the injection site, please see lesions already described at the recommended dose under section 4.f. Do not use in dairy cows producing milk for human consumption (during lactation or the dry period). Do not use within two months prior to first calving in heifers intended for the production of milk for human consumption. Cefquinome is an antibacterial of the cephalosporin group which acts by inhibition of cell wall synthesis. It is characterised by its broad therapeutic spectrum of activity. As a fourth generation cephalosporin, it combines high cellular penetration and a high stability against beta-lactamases which predict a lower probability for selection. In contrast to cephalosporins of previous generations, cefquinome is not hydrolysed by chromosomally-encoded cephalosporinases of the Amp-C type or by plasmid mediated cephalosporinases of some enterobacterial species. Resistance mechanism in Gram negative organisms due to extended spectrum beta-lactamases (ESBL) and in Gram-positive organisms due to alteration of penicillin binding proteins (PBPs) may lead to cross-resistance with other beta-lactams. In vitro activity has been demonstrated against common Gram positive and Gram negative bacteria including Mannheimia haemolytica, Pasteurella spp., Histophilus somni, Escherichia coli, Klebsiella spp,, Salmonella spp., Arcanobacterium pyogenes, Staphylococcus aureus, coagulase negative Staphylococci, beta-haemolysing Streptococci. Cefquinome has no antimicrobial activity against Mycoplasma spp. A total of 197 Pasteurella multocida, 107 Mannheimia haemolytica and 33 Histophilus somni isolated between 2000 and 2006 from the respiratory tract of diseased cattle in Belgium, France, Germany, Italy, Ireland, the Netherlands, Spain and the United Kingdom were investigated. The MIC90 for Pasteurella multocida and Mannheimia haemolytica strains was 0.032 µg/ml, and 0.004 µg/ml for Histophilus somni strains. The period of time that plasma concentrations were above MIC (T>MIC) for Pasteurella multocida and Mannheimia haemolytica (MIC90 = 0.032 µg/ml) was 80.7% of the treatment interval or 38.7 hours. Maximum serum concentrations (Cmax) of about 1 ?g/ml are reached after 2 to 12 hours after subcutaneous administration of the product at the recommended dose of 2.5 mg/kg. Cefquinome is < 5 % protein bound and excreted unchanged in the urine. In calves, 90% of the dose are recovered in urine and about 5% from faeces. Any unused product or waste material should be disposed of in accordance with national requirements.